Weekends! 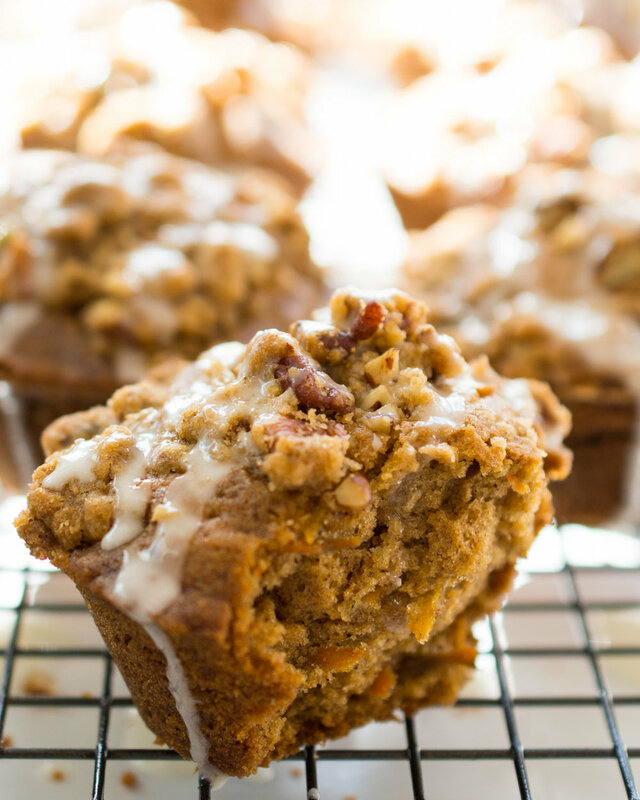 They are made for leisurely breakfasts with Carrot Cake Muffins. Just because enough is not enough, I have added a pecan streusel and a lemon glaze. All guilt is reduced because there is a heavy dose of fresh grated carrot. It looks like a lot of work but it all comes together in a flash. I am growing Cosmic Purple carrots. On the top of the soil everything looks like it is going well, but underneath it is another story. The carrots grow fat and have big fluffy tops but they do not grow long. I suspect I let them languish in seed starting trays a bit too long. We have all done it - gotten too busy and the actual planting happens a bit too late. Not to worry, though, my crazy looking carrots actually taste very good and freshly harvested carrots are super sweet. 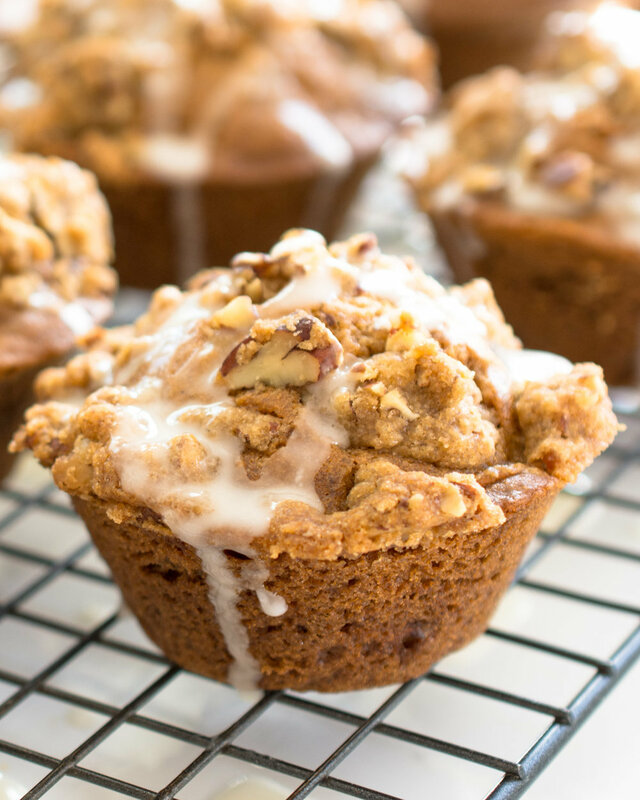 The muffins are baked with a pecan streusel on top. So, mix up the streusel first and set aside. At the same time prep your muffin tin with oil or butter and grate a big pile of fresh carrot - any variety is fine. You might notice that once peeled the purple carrots are orange with little purple speckles - magic. Stir together all the dry ingredients except the brown sugar and set aside. The muffin batter is made by whisking the eggs and the brown sugar until fluffy, giving the muffins a more cake like texture than a traditional muffin. 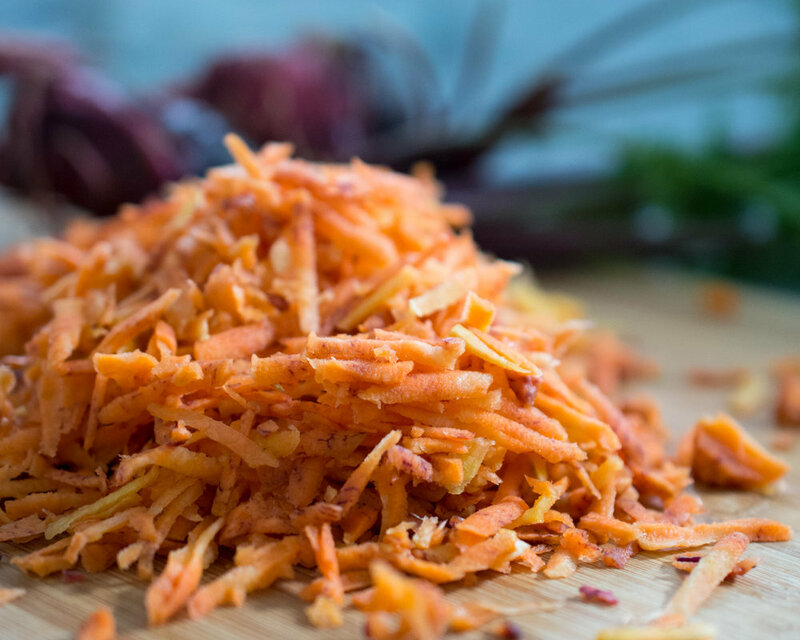 Once your eggs and sugar are fluffy, stir in the grated carrot. Add the reserved dry ingredients and stir just until mixed. Spoon the batter into your prepared muffin tin. You will have enough batter for 12 standard size muffins. If you want bigger muffins divide the batter between 9 muffin cells. 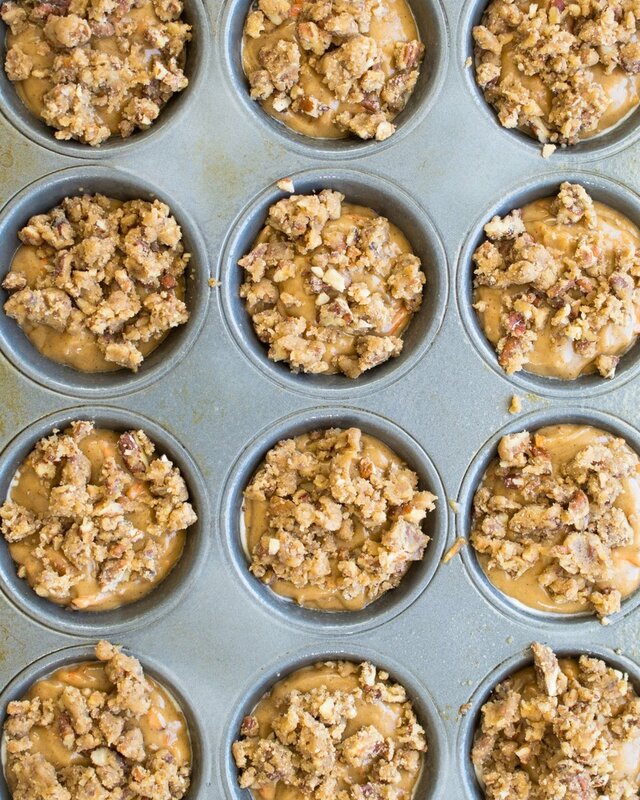 Top the muffins with your reserved pecan streusel and bake. Once the muffins have completely cooled, mix up the glaze and drizzle on top of the muffins. Now if the glaze is just too much for you - skip it. The muffins are perfectly yummy without. Make streusel by combining all the ingredients in a small bowl. Mix to a crumb texture by hand. Set aside. Prepare to standard size 12 cell muffin pan with oil or butter. In a small bowl stir together the flour, cinnamon, cloves, ginger, salt and baking soda. In a large bowl, whisk together the eggs and light brown sugar until they are light and fluffy. Add the vanilla extract and buttermilk to the egg mixture and stir until combined. Mix in the oil by slowly pouring in. Stir in grated carrot. Add the dry ingredients to the wet and mix just until incorporated. You may want to add a little more buttermilk here if the batter seems too thick. Pour into prepared muffin tin dividing the batter evenly between the 12 cells. 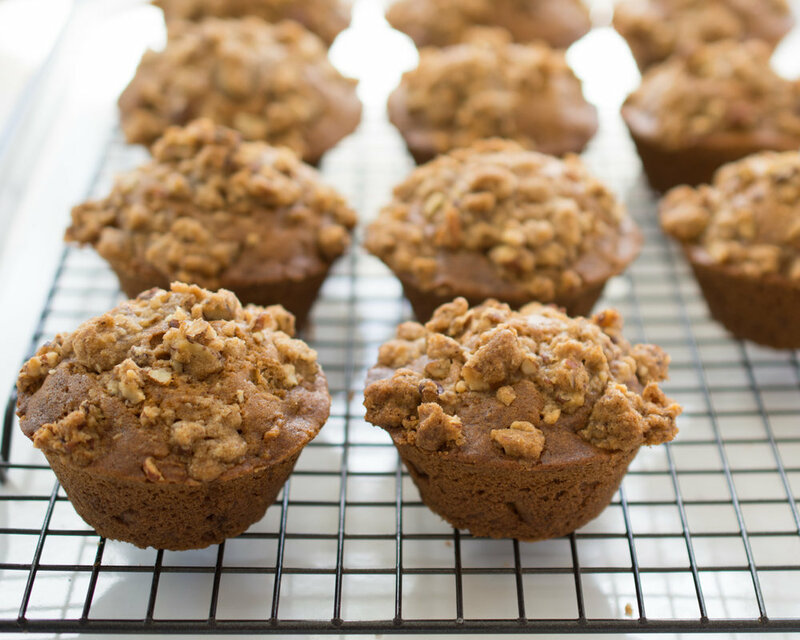 Top each muffin with the crumbled streusel. Bake for about 25 minutes or until tester comes out clean. Cool for 10 minutes on a wire rack. Remove from pan and allow muffins to completely cool. Make glaze by adding lemon juice to the sifted powdered sugar. Stir vigorously to remove any clumps. Drizzle glaze on top of each muffin.